Local black beans:. Soak overnight or all day and cook in a slow cooker on low for 12 hours or so with chili, gaarlic, cumin and salt. Perfect every time but I admit I don't refrito them. And of course, those with a Villa Market or Foodland in the vicinity can buy the 1 lbs bags of dry pinto beans imported from the U.S. that they've both stocked as a standard item for many years. 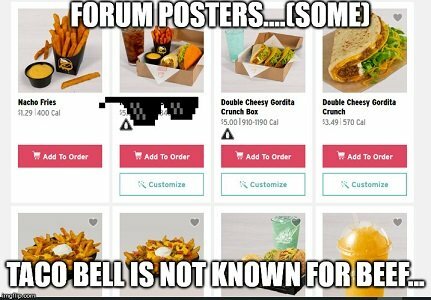 Taco Bell is not really known for the beef, beans perhaps, but not beef, that’s just silly. I'd argue beef and beans together are core ingredients in the Taco Bell menu in the U.S., in all their various menu variations. Far more than the Taco Thailand notion here of ground chicken tacos and pulled pork. In the U.S., from my past Taco Bell days, it's bean burritos, ground beef tacos, burritos with ground beef and various other fillings, etc etc.... I can't remember ever ordering a ground chicken taco at Taco Bell U.S. When I wanted vegetarian, their 7-layer burrito also was a favorite, being beans, rice, cheeses, veggies and sauces by default. It also tended to be one of the healthier choices on their menu. Another menu choice that's conspicuously missing from the offerings here at Taco Thailand. I agree that beef is a core ingredient to their US product offering, but claiming Taco Bell is “Known” for their beef? Lard is a core ingredient as well, are they known for that? Yes, Taco Bell is known for its beef in much the same way that McDonald's is known for its bread. I agree completely. I think they should offer beef and beans. I think importing canned refried beans would be easy . Actually, I think canned refried beans and tortillas are available at Macro. My comment was in response to the suggestion that Taco Bell buy dry pintos from Villa Market and (apparently) process them on site. Do you not see the humor in that? That exchange was about making your own refried beans here, and the local availability or not of said beans. It wasn't about how Taco Bell makes their frijoles. Read before posting. About the same as KFC and no biscuits. And as I pointed out above, you're obviously suffering from severe reading comprehension problems... Hilarious!!! Why would I want to make my own refried beans here when I could just buy La Victoria at Macro? Yes, and we all know TV members are “known” for their reading comprehension skills, it’s one of the core disciplines required here. By doing homemade, I can make a healthier version that I prefer that doesn't have all the high salt levels and/or high fat levels that the canned refried beans here tend to have. I like my own style better. Maybe you could get a job at Taco Bell. I like pintos better before they’re refried.